It seems almost impossible that three men could produce music at this level of manic intensity. 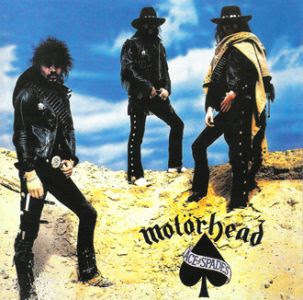 Motorhead defied a lot of logic to produce Ace Of Spades, one of the landmark albums in the history of heavy metal. With a focus on the wild west and a wildly insatiable appetite for women, Lemmy Kilmister employs his strained, tortured, gravelly vocals to fantastic effect as he pretends to sing his way through a collection of classic songs. "Fast" Eddie Clarke earns his nickname on a guitar that alternates between out of control and barely in control, and Phil "Philthy Animal" Taylor pounds his drum set into submission with a fearsome combination of intensity and power. It all comes together on high speed, relatively short rock 'n roll 'n metal songs that are constructed up from the simplest elements and chords to deliver targeted explosions of dynamite. Ace Of Spades, Love Me Like A Reptile, Shoot You In The Back, (We Are) The Road Crew and Dance are today instantly recognizable classics of metal, and they are all packed into the first nine songs of this CD. While Ace Of Spades is the most famous track, (We Are) The Road Crew best exemplifies how Motorhead use the simplest structures to move moutains. It is unfortunate that Ace Of Spades was not truncated after nine songs; the album finally runs out of ideas, and the final few tracks are both relatively disappointing and wholly unnecessary. Ace Of Spades is a celebration of metal at its most fun and furious, topped off by that classic album cover: three British guys pretending to be tough hombres in a pose that can only be inspired by the Italian spaghetti variation of the American western.